Does density matter for mode share? The accompanying chart shows how public transport’s share of the journey to work varies with population density across 41 US and Australian cities. It is taken from the same article that I mentioned in my last post. The authors, Dr John Stone and Dr Paul Mees, find there is only a modest relationship between population density and transit share (R2 = 0.229). 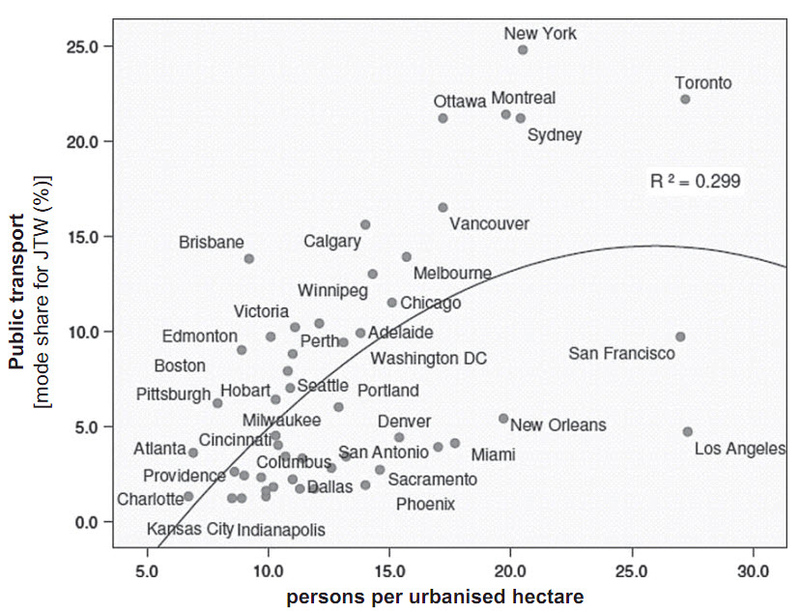 They conclude that “higher density across the whole urban region is not the explanatory variable that many might expect”. Los Angeles, for example, is the densest metropolitan area in the US – denser ever than New York – yet the chart shows public transport’s share of work travel in LA is much smaller than in NY. If that seems counter-intuitive, your intuition could be right. The chart uses average population density calculated across the entire urbanised area of each city. While that’s perfectly alright in some contexts, it doesn’t allow for the possibility that public transport’s ability to win travel away from cars is related to the morphology of density – the ‘peaks and troughs’ in the way the population is spatially distributed. It’s possible that the relative proportion of population in high density areas vs low density areas has a greater impact on mode share. Using average density probably won’t present a serious problem with cities like Atlanta, Austin, Dallas, Phoenix and Portland where the population is overwhelmingly suburbanised at relatively uniform (low) densities. But it could have a big impact on places like New York which have an extensive ring of low density suburbs as well as a high density central region e.g. Manhattan and Brooklyn.